Pinless track base for installing t-molding makes finishing your floors a snap. 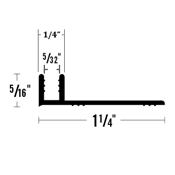 This aluminum track base is sold in 4’ sections for easy installation. 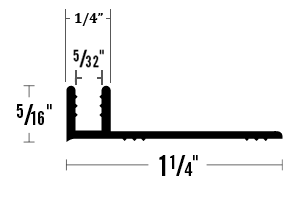 When installing t-molding the track must be secured using nails or adhesive. Track base without pins cannot be used with stretch in carpet. Aluminum base for installing t-molding will work with these items. Once the track base is secure the t-molding will snap into place. Find vinyl track base and aluminum track base with pins. Before your begin installing t-molding check out this helpful video. Proudly made in the USA, order your track base today.